Business Banking 101 – REDI | Regional Economic Development Inc. Does the thought of setting an appointment with a commercial loan officer make you really nervous? Wendy Moore with Central Bank of Boone County is here to help you calm those nerves by sharing why having a lender on your side is a great asset to your business. 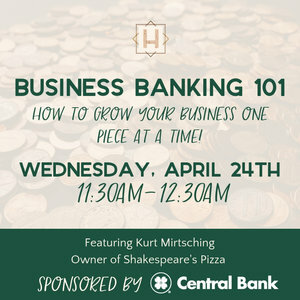 We will also hear from one of Columbia’s top business owners, Kurt Mirtsching, owner of Shakespeare’s Pizza – (yes, lunch is provided). Kurt will share his story of growth here in Columbia, and what it’s been like to be a business owner. Attendees will need an appetite for Shakespeare’s Pizza and pen and paper for notes. Wendy Moore is a Relationship Manager for Central Bank of Boone County. “Being a relationship manager is really about being a customer advocate within our organization. It’s our job to make sure our clients are aware of products and services that benefit them while working to improve current offerings or create new products and services within the bank. We connect customers, potential customers, our community and our bank to bring them all together.